The first is a search of school records, followed by a request for a baptism certificate. I quite enjoy doing these as it’s nice to find a quiet table somewhere and delve into a bit of history. It’s even nicer when I actually manage to find some information! The clergy signature on the baptism entries can be troublesome, but a quick look at the Diocesan Directories sorts out that problem! Next is the team enquiry folder – these are the more complex or lengthier enquiries that cannot be answered immediately. There are a handful in today, which I will either do myself or pass on to eager colleagues. There is also a complicated request for personal information from records we hold, which I can make a start on. Just time before lunch to check the post that has found it’s way to my desk. It’s an application form to view closed records. This has been authorised so it doesn’t take long to finish processing. 1.00 – I normally take over as Duty Archivist, following a quick handover of any issues or difficult material from the morning. It looks quiet now, but you can never tell how it will be, particularly as we are expecting a couple of new researchers. Looking at the documents for today, there is a large pile of building plans I’ll have to check before serving. The condition of these can vary considerably and I’m convinced some fall apart just by looking at them! A couple of Boulton and Watt researchers are in this afternoon. One is working their way through correspondence which is already out, however another is trying to convert old reference numbers into new – thank goodness for my colleague who makes it look easy! Some uncatalogued material from the Birmingham Small Arms Company collection has been requested too, but that proved more straight forward than anticipated – for a change! Despite a few complications, this afternoon has gone smoothly – I haven’t been shouted at and I haven’t had to politely ask anyone to stop licking their fingers when turning the pages! A real highlight though has been the Shakespeare First Folio which is waiting to be returned to it’s home in the Early Fine Print collection. We can’t resist a peak. Being this close to history is definitely one of the perks of the job. 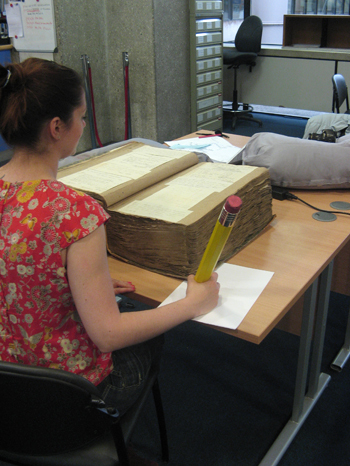 This entry was posted in Behind the Scenes and tagged Archives, Birmingham, Heritage Sector, West Midlands. Bookmark the permalink. The giant pencil was a present from me for Nikki when she started her present post as creative learning officer for archives. I like to think of it representing ‘think big’, ‘think outside the box’ or ‘the pencil is mightier than the sword’, not ‘please use a pencil’. Still, at least it’s getting good use. Thanks for photo and blog.